Brunch, Brazilian eats, Arab bread, soul food, and more. Sandra Davis (left), Lea Redmond, and Anna Villalobos opened Oeste in December. Within the last year, the East Bay has seen a slew of restaurants and cafes open with women at the helm. As it often goes in this industry, some only lasted a few months while others showed immediate staying power. Here are some of our favorite new spots spearheaded by women, listed from youngest to oldest. At her one-month-old North Berkeley cafe, Delvira Rodrigues churns out seven flavors of pão de queijo, the chewy, addictive, and naturally gluten-free Brazilian cheese bread. Depending on the day, you might stumble upon little breads sweetened with guava, studded with sun-dried tomatoes, or made even cheesier with catupiry, a soft, creamy Brazilian cheese. And you can even buy them frozen to bake off at home — a prime party trick. While pão de queijo is the main draw, Brazilian Bread serves a host of Brazilian eats: acai bowls, yuca fries, meaty sandwiches, and tapioca crepes with sweet or savory fillings, among them. Nite Yun's ode to the golden age of Cambodia promises to convert hoards to this lesser-known Southeast Asian cuisine. While most Bay Area Cambodian restaurants only serve a handful of traditional Cambodian dishes — and fill out the menu with simple stir-fries and familiar Thai fare — Nyum Bai exclusively serves the sort of Cambodian eats you would actually find in Cambodia. That means lots of prahok, fermented mudfish, and kroeung, a spice paste teeming with lemongrass and galangal. The tiny Fruitvale restaurant feels contemporary and retro at once, with classic Cambodian rock always on blast. This cozy cafe comes from Cassandra Chen of Cafe Fanny Granola and CC Made. In a sense, it's a retail spot to showcase her organic granola — the same recipe from the original Cafe Fanny circa Alice Waters — and incredible caramels, but it's also a full-fledged eatery serving creative granola bowls and toasts for breakfast and lunch. Think along the lines of Acme pain au levain topped with fromage blanc, curry cauliflower, and capers, or an Instagram-ready combination of crunchy granola, golden berries, seeds, and matcha-infused Greek yogurt. By day, Oeste functions as a sweet cafe slinging lavender oat milk lattes, Spanish tortilla, and grab-and-go sandwiches for the office crowd. At night, the buzzy bar area comes alive. With beaded chandeliers, plush seats, and gorgeous marble, Oeste feels like a prime date night destination — and the excellent cocktails, wine list, and unpretentious service definitely don't hurt. The menu merges soul food and Central American influences alongside some Asian touches. A bit scattered? Maybe. But as owners Anna Villalobos, Lea Redmond, and Sandra Davis were going for, it's also hella Oakland. Chef-owner Nilgun Boyar draws inspiration from several countries that hug the Mediterranean Sea — Morocco, France, Lebanon, Italy — but her best dishes reflect her Turkish and Greek roots. The restaurant's namesake moussaka, soft and savory with ground lamb and eggplant, is Boyar's Greek grandmother's recipe, and it's absolutely delicious. With its hip furnishings, open kitchen, and beautiful vintage ceiling, Moussaka Mediterranean Kitchen brings a refreshing elegance to San Leandro's dining scene. 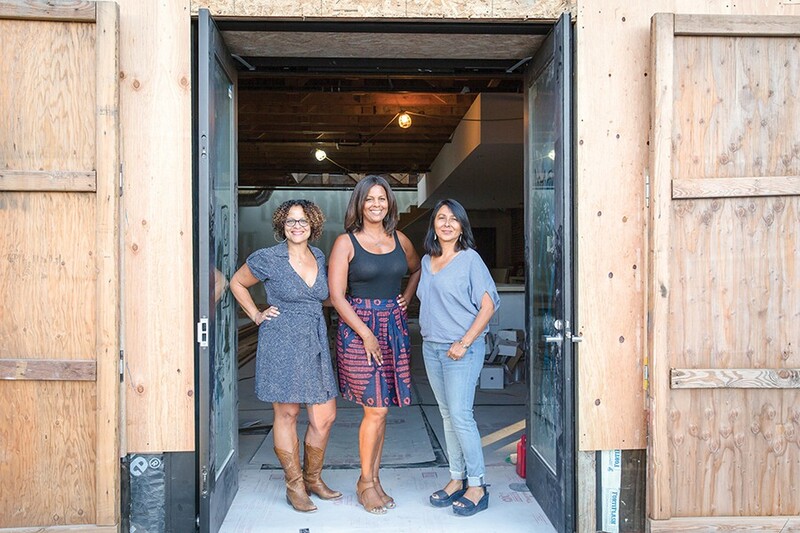 Eclectic, funky, and down-to-earth, North Oakland's Copper Spoon debuted with an immediate following thanks to owners Vita Simone and Carmen Anderson and their old food truck, Sassafras Seagrass. With visible homages to the Black Panthers, a particularly diverse staff, and progressive business practices, it's easy to root for Copper Spoon before even trying the food and cocktails, which are generally excellent with unexpected touches. While the restaurant has recently expanded with lunch, brunch, and late-night menus, you shouldn't miss the dinner-only beets, prepared three ways and paired with whipped smoked yogurt. The flavors really sing at West Oakland's Ivy Moon. After dabbling with dinner, owner Tanesia Sellman has settled on an all-day brunch spot with Southern flare. The plating is often elaborate, colorful, and floral, adding to the warm bistro environment. While the chicken and waffles may be the most popular, Ivy Moon's seafood is its strongest suit. Don't miss the blackened cod sandwich, loaded with pickled peppers and a vibrant cabbage slaw, and the shrimp and grits, which come with a runny egg, crispy-fried grits, and zesty greens. No other new Oakland restaurant has gotten as much national love as Reem's, the Arab bakery in Fruitvale. That's because of owner Reem Assil's inspiring story, the eatery's social justice bent, and the heavenly mana'eesh. These pillowy, made-to-order flatbreads form the basis for many of the delights at Reem's, but there are also delicate pastries, colorful dips, fresh salads, and lamb burgers at night. With community events, rotating dinner menus, and seasonal offerings — a falafel containing a soft-boiled egg inside might have broken Instagram — it's always a good time to visit Reem's. With bold colors, radical artwork, and an air of inclusivity, Navi Kitchen appears immediately identifiable with its community-minded owners Preeti Mistry and Ann Nadeau. The sunny Emeryville cafe specializes in hearty, 14-inch pizzas loaded with Indian flavors. They're all delicious, but the Grateful Guju, a combo of fenugreek pesto, Brussels sprouts, ricotta, and chai-spiced bacon, is particularly gorgeous and bright. Also worth the trip are Mistry's cumin-scented lassis, breakfast sandwiches, and genre-bending tikka masala mac 'n' cheese — $1 of which gets donated to the local nonprofit Destiny Arts. After a decade in the wholesale tea business, Julie Baron opened her first charming cafe and tea garden in Alameda. And 12 years after that, she opened a version in Temescal. The one-year-old cafe replicates Baron's successful Alameda recipe while ramping up the food a notch. In addition to fabulous tea, flaky pastries, and attractive options for vegans and grain-free eaters, Julie's also serves up mean brunches, broth bowls, and seasonal tartines that showcase top-notch, locally sourced ingredients. The bright, airy, and modern space boasts a peaceful back patio primed for sipping tea with a good book.